This first one is just too cute, right? I am so obsessed with fabric pumpkins this year. 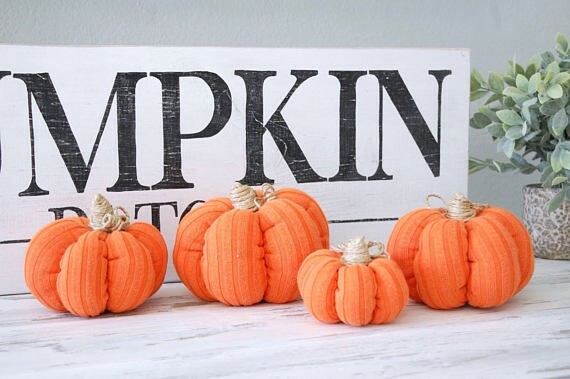 From velvet to knit, it seems like fabric pumpkins are everywhere. It's not only a beautiful way to mix up your usual pumpkin centerpiece, but it's something that will last year after year. 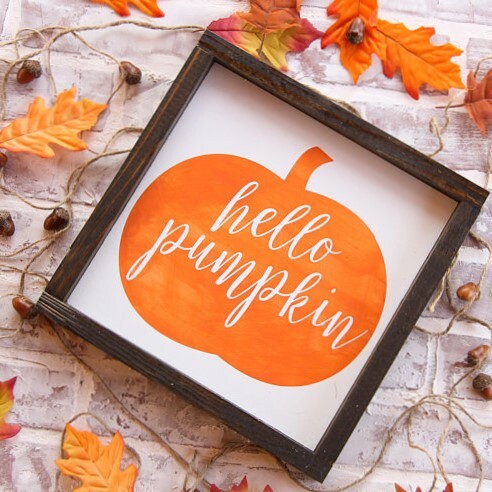 The beautiful Fabric Pumpkins by Strung on Nails come in so many different colors, from traditional autumn shades like orange and mustard, to modern shades like white and aqua blue and even patterned pumpkins. Julie at Strung on Nails carries a few other home goods, like painted signs and gorgeous string art. A few of her string art signs are perfect for the fall season, so be sure to check those out! 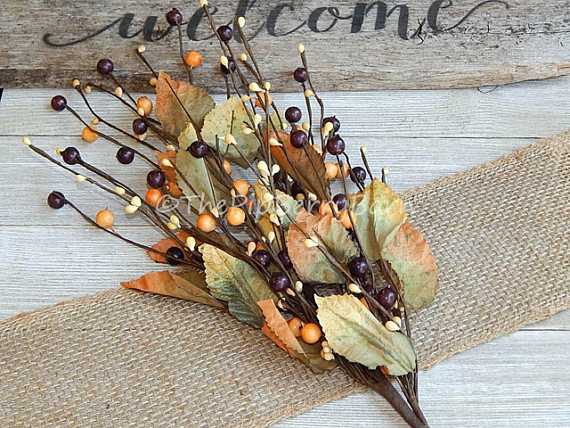 Another autumn decor item I simply cannot get enough of are these rustic fall signs. Sometimes it's hard to know what to do with the cute little pumpkins and fall accessories we collect over the years. A fall sign like this "every year I fall for..." sign by Chalk in Hand serves as a centerpiece that can pull the whole look together. Hang it up by a mounted shelf, like you see in the picture above, or lean it up against a wall on an entryway table or counter. 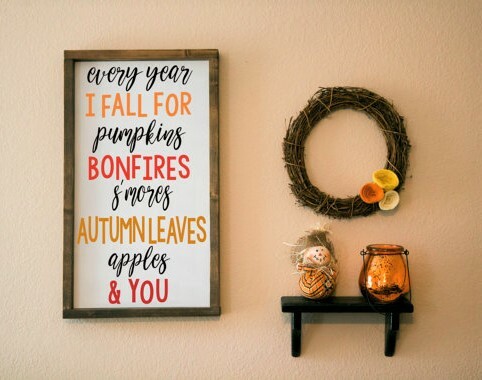 Alec of Chalk in Hand has so many great seasonal items, including some really cute Thanksgiving and Halloween signs. If you like these rustic signs with a more modern design, this is the shop for you! And I know we've established on the blog that I am totally obsessed with Fall, but I am equally obsessed with Halloween as well. I could never have too much Halloween decor! This Rustic Halloween Decor by Timeless Decor Art is another great versatile item. You could arrange it on your front porch with some pumpkins, on a fireplace mantle, or an entryway table. It would be really cute on a Halloween buffet table with some mini pumpkins and black tapered candles. 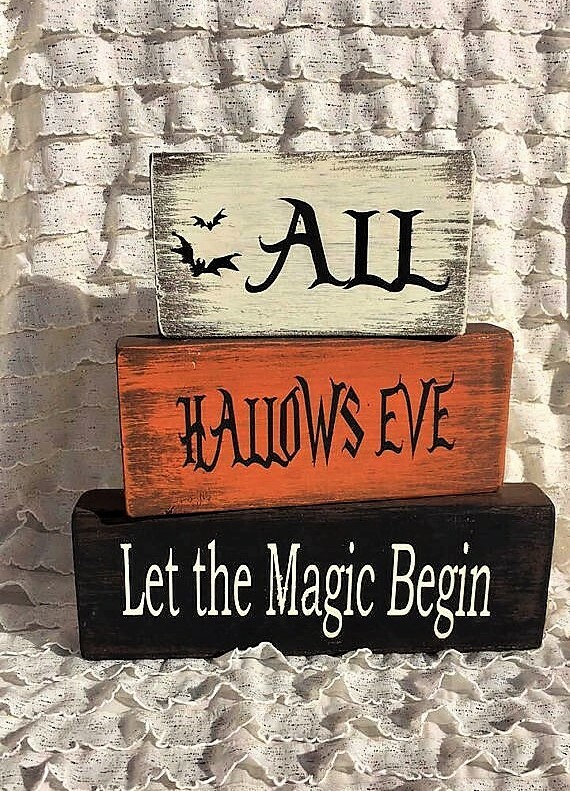 Carly-Anne at Timeless Decor Art has several different Halloween designs, as well as autumn decor; including hanging signs and rustic wooden pumpkins. And trust me, you're going to want to see the Christmas decor in her shop too! This next shop is the place to be if you want to craft some truly beautiful holiday garland or wreaths! I love seasonal floral picks for making wreaths, adding to garland, making holiday arrangements, and for embellishing holiday gift wrap. This Brownstone Berry Floral Pick by The Pip Berry Barn is perfect for any of those things. I may sound like a broken record, but I'll say it again...I love holiday decor that can last year after year. Sandy's designs are rustic and festive, though the holiday berries and the mix of colors give off a bit of a modern vibe as well. You can stock up with her Buy One, Get One FREE sale, so it's definitely time to shop! As I said before, I cannot get enough of these Autumn signs! 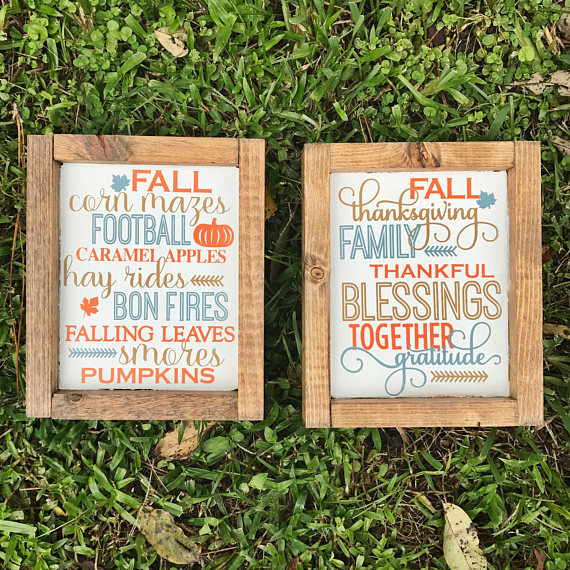 These Rustic Fall Signs by Sweet As Tea Rustic Home Decor really caught my eye because of the colors. I love the traditional orange and brown fall shades paired with the blue. It gives it such a fun and modern vibe. Amber sells several Halloween and holiday signs too, including a reversible Thanksgiving and Christmas sign! But don't miss her other items either. You'll find some really sweet family signs and photo frames, some of which can be personalized. Check out current sales here, and use the code SHIP75 for free shipping on any orders that cost more that $75! Now we could all use a Christmas preview, right? My husband and I saw some ornaments out at the store the other day and couldn't help looking through all of them. I am trying my hardest to stay in the moment with Halloween, but let's face it, as soon as it's November 1st, we're going to be all about Christmas! 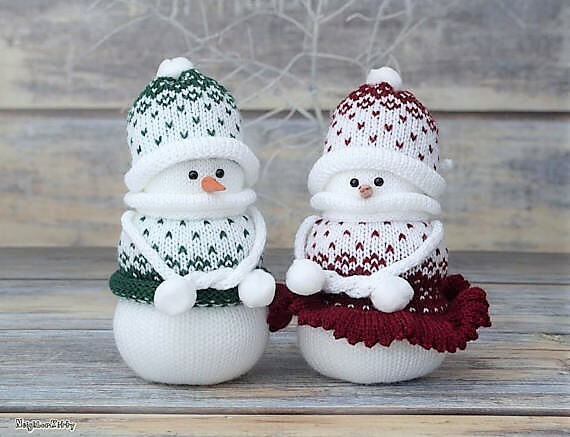 How adorable are these knit snowmen ornaments by Neighbor Kitty?! You'll find so many adorable items at Neighbor Kitty, like needle felted animals and Knit Pumpkins. Though for some major Christmas eye candy, check out all of the knit snowmen, and be sure to browse the sale section as well! Great post, thanks for sharing :) such cute items!